Where would you go if you had a machine that would take you anyplace you wanted — instantly? A Rescue and a Near Death Experience is not what you would expect to find on a nearly perfect world like the beautiful Blue Angel Planet. This is a fast paced adventure that has it all. Millie and Honey begin with a nightmare and rush to unravel the mystery that surrounds the dream they share, only to find that sometimes the real thing is more bizarre than the dream. Hold on to your seats as this knuckle biting adventure twists and turns, with lots of unexpected outcomes. More questions are asked than get answered in this volume. Maybe it will all come together in the next. In this volume of the ‘Millie & Honey’ series, Millie and Honey share a dream and race to the Blue Angel Planet via the traveling machine. Once they arrive, they discover the wonders of this amazing planet while trying to unravel the mystery of their disturbing dream. Expecting to have one mission, they find that one leads to another, even more exciting adventure. “I am getting a stronger image of the source of the loneliness,” Millie thought. Their tethers pulled tight as the angels veered toward the north and they increased their speed. The wind rushed by, blowing briskly over their faces as they flew rapidly toward the anguished cry for help. They could feel the awareness of the dog grow stronger as they neared. Their sorrow and sadness pressed harder against them like the sound of a speaker gets louder as you draw closer, till nothing exists except the numbing sensation. 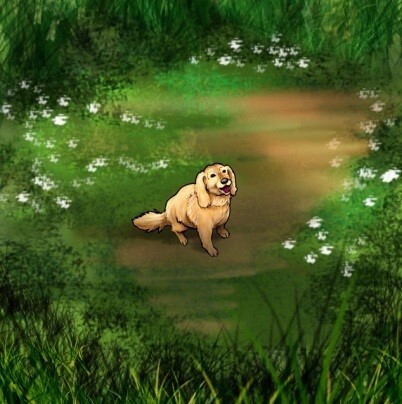 Honey looked over and saw the dog sitting in center of a small clearing, his head up, looking into the surrounding mountains. 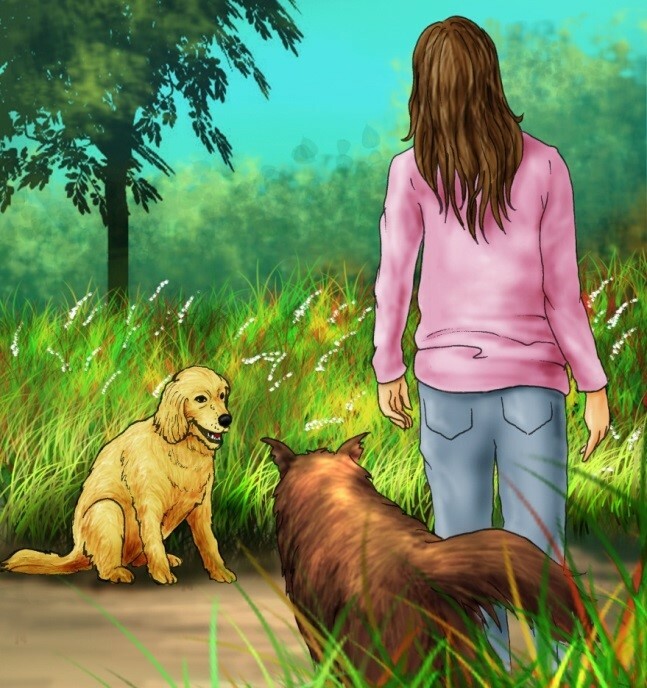 She saw him stand up and wag his tail happily as he observed them approaching. 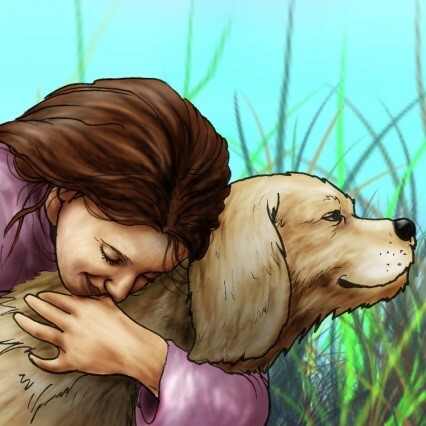 He wiggled close to Millie and licked her face frantically as she held him and talked quietly. “What is your name sweetie?” she asked after a few minutes. He began to cry. Lying down, his body grew limp, except for the agonizing sobs as the grief washed over him in waves. Everyone felt the overwhelming pain of heartache, which emanated from him in a flood of emotion. Millie held him closely and rocked him back and forth as she talked to him. She heard Honey sending her love to him also. “You will love playing with my children,” she thought and sent him pleasant thoughts of her puppies playing in the yard around the house. Millie brought her head up quickly and looked at Honey, then to Joseph and Noah in surprise. “He heard us!” she thought, stunned. “You mean I am special?” Archie wondered as he looked around nervously. Everyone turned toward the direction that he indicated and peered into the forest. Everyone stood frozen! They were so intent on finding Archie that they did not sense the other subtle impressions until now. Opening themselves and expanding their attention, they realized that there was another heavy feeling of despair and helplessness. Millie and Honey detected the fear intensely, but the Blue Angels only felt a discomfort. They had previously ignored the emotions as an echo of the strong vibrations that Archie emitted before they arrived. Now the vibrations hummed inside their heads and they looked about, trying to orient themselves to the direction of the fear that enveloped them. They tried to discern which way to go, but Archie stood and walked toward the direction that he had shown them. They are over there,” he said, as he ran off toward the south. He stopped to sniff the air a few times along the way, to make sure that he was headed in the right direction, and to let everyone catch up. When he heard them getting close and had a good scent, he took off again. The closer they came to whatever it was that emitted the fear, the harsher the feelings grew, until their nerves were raw from the panic. The distress began to clarify into separate individuals that shared the same terror. It was a family, they began to realize, and one of them was in terrible danger. A thundering noise began rising in pitch with every footstep they took. It was a foreign sound, like a thousand jackhammers pounding the ground. It was a drumming sound that shook the ground under their feet. They did not recognize the sound, but it was vaguely familiar. They ran as fast as they could toward the feeling of distress that seemed to be closing in on them. They could almost see a picture of what the threat was, but they were unprepared for what they saw, when they broke out of the forest. 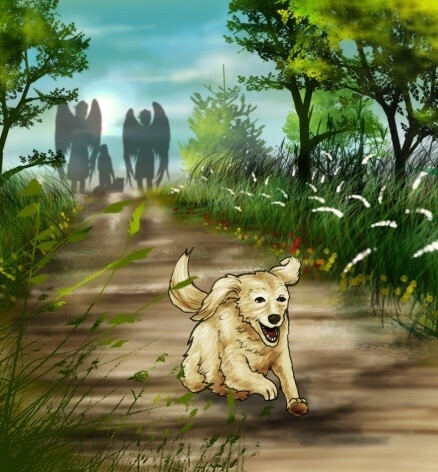 Millie remembered the dream that brought them rushing to the Blue Angel Planet. She remembered the falls as she and Honey flew close, suspended from the angels in the harnesses. “The Dream! Honey, these falls were in our dream.” The thoughts tumbled out in her mind as they witnessed the scene before them. Everyone heard the scream in Noah’s mind and saw the water surging unendingly over the edge of the cliff. The pounding in their feet told them that the water fell a long way before battering against the rocks far below. They stopped, mesmerized by the scene before them. A young girl about 6 or 7 years old with long golden blonde hair was clinging desperately to the wheelchair she was in, with one hand as it hung perilously balanced on the edge of the cliff. The ground below her chair had shifted and she dangled over the edge at a dangerous angle. Her legs dangled almost into the water as she tried frantically to stay in the wheelchair. Her other hand clung to a long branch that was held by a young man who laid on the ground, to keep from sliding, while gripping the other end of the branch in both hands. A young woman sat down and held one of his legs, while two girls about Millie’s age pulled on his other leg, to keep him from sliding over the edge. It was obvious to everyone in that split second as they stood there motionless, what had happened. 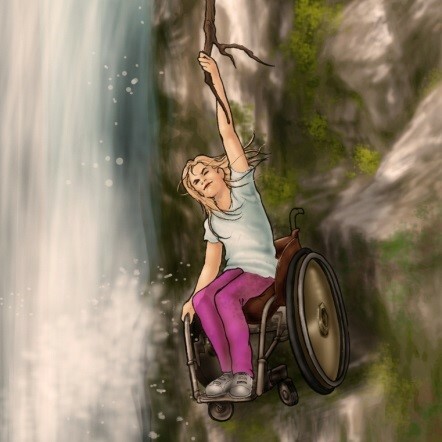 Brodie had rolled her wheelchair close to the rim of the waterfall to look over into the valley below. The ground below her chair was soft from the water spray and the earth underneath that area of grass had been worn away from years of water slapping against it. 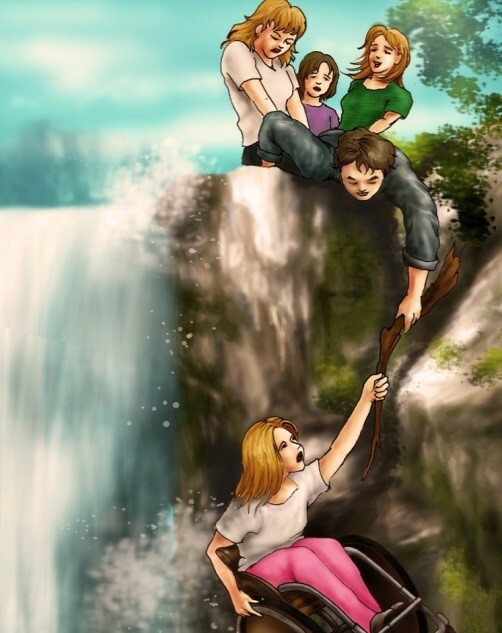 When she maneuvered her wheelchair near the brink of the waterfall, the ground gave way. It sank slowly toward the brink of the great falls. He father just had enough time to grab a nearby branch and hold it close enough for her to take hold with one hand. His feet slipping on the muddy grass, he laid down to keep from being pulled onto the sagging clump of earth that was slowly slipping down over the edge, where it would soon plummet to the valley far below. Despite his best efforts to pull his daughter to safety, gravity and the weight of Brodie and the wheelchair were pulling them both over slowly. As he slid across the ground, Brodie’s mother and her two sisters grabbed her father’s legs in an effort to hold them and stop their slow slide toward the endless drop. “DADDY!” the girl screamed in terror. “Hold tight, Brodie,” he yelled back. “It will be okay.” But everyone could tell that they had held onto the branch for a long time and he and Brodie were both showing signs of exhaustion. The ground around everyone looked wet and there were signs that they had all slipped several feet toward the lip of the sheer drop, where Brodie dangled over the edge of the abyss. Suddenly, a blur of yellow fur bound past the group, who stood staring, hypnotized at the boarder of the forest. Running at top speed, he leapt over Brodie’s mother, father and two sisters and grabbed the branch, just past her father’s hands, and pulled. Nothing seemed to happen. Archie tugged again. Nothing. Again and again, he yanked at the branch with all his strength, throwing his weight into each pull. He jerked harder and faster with each attack, as he dug in his paws. Finally, the wheelchair moved. It righted itself and began, ever so slightly, to crawl slowly back to the solid ground. Everyone pulled with renewed strength. 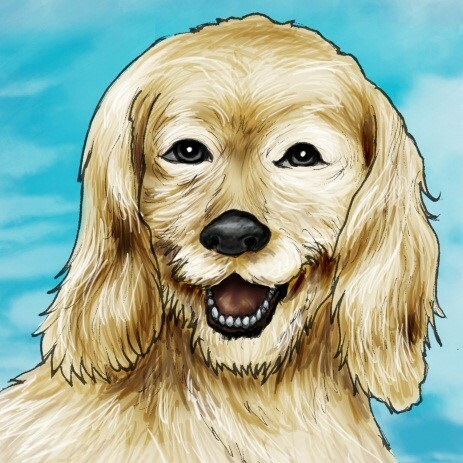 Millie, Honey, and the two Blue Angels rushed forward, coming out of the astonishment that froze them when they first stepped out of the woods and saw the situation before them. They grabbed onto the father’s legs, while standing on firm ground and pulled hard, raising him off the ground. His grip on the branch held fast and together, they pulled the wheelchair and Brodie closer to safety. The chair’s wheels rocked on the rim of the crack, where the large tuft of land broke free. Everyone tugged in unison. Each tug brought the wheels nearer to safe ground, but as they leaned forward for another jerk, the chair rolled that fraction of an inch back over on to the slipping earth that seemed to be closer to breaking loose and freefalling into the depths below. Everyone reached forward, slowly letting Brodie’s father lower towards the ground. Everyone gripped with all their strength and tensed for a tremendous tug, when the earth below the wheelchair shifted, tilting sharply toward the valley floor. Interrupting the rhythm of the coordinated pull, the team hesitated for just a few milliseconds allowing the chair’s wheels to roll forward a half inch, as the ground began sliding, before the branch tensed. Instinctively, they all yanked backward as one, but it was in vain. When the branch went tight as the wheelchair slid forward, the branch had snapped and everyone fell to the ground. Brodie’s father fell two feet onto the mushy ground still clutching the branch which ended in a jagged edge, a foot from the other end that Brodie held. Millie, Honey and the two Blue Angels fell into a sitting position, when the branch severed, inches from Brodie’s hand, and every eye watched helplessly as Brodie and the chair rolled rapidly to the brink of the quickly sliding piece of ground that was nearly to the point of breaking free and falling, holding now by only a few tufts of grass. 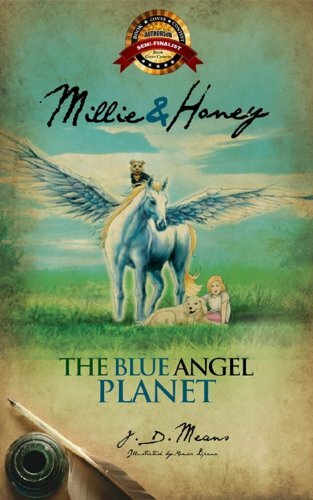 Millie & Honey – The Blue Angel Planet? I read this Hook (an ebook excerpt/sample) and found it very interesting, thought it might be something for you. 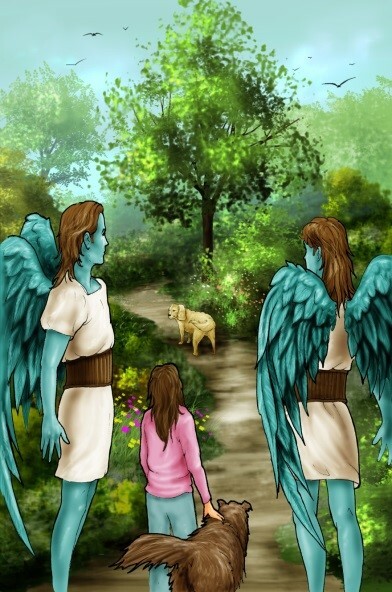 The book is called Millie & Honey – The Blue Angel Planet and the excerpt is located at http://ebookshabit.com/hooks/millie-honey-the-blue-angel-planet-by-j-d-means/.